Horley Online is the community website for Horley in Surrey. 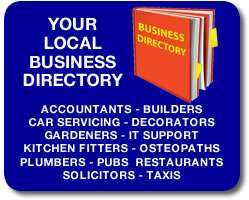 Over 1200 local people a week visit Horley Online. It’s your community website – so let us know what’s going on. Saturday 27th April, 10am – 4pm. 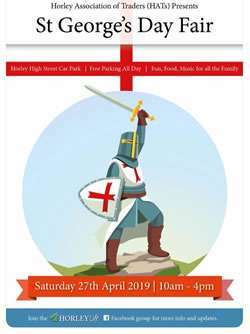 Organised by HATS (The Horley Association of Traders) Due to the ongoing works in the pedestrian precinct, this year it will be held in the town centre car park. Horley Library has closed and will reopen on Tuesday 30th April. 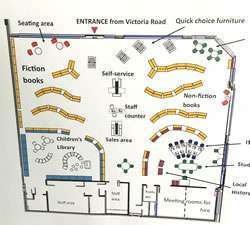 Here is a brief glimpse of the layout for the new library. 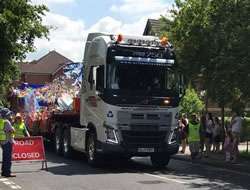 Horley Carnival Saturday 15th June. 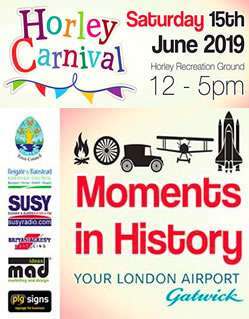 Contact the organisers via the Horley Carnival Facebook page. There are concerns in and around Horley that the drilling for oil at Horse Hill may be causing the earthquakes that some have felt in our area. The BBC website has an article outlining findings into Surrey earthquakes. Click here. This info was taken from the Surrey County Council website – 22/3/19. a talk entitled “LILLIBET” – a fond look at our Queen. 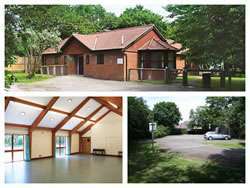 Venue – The Regent Hall, Albert Road, Horley (free parking)Doors open 1.30 am.New members and Visitors (£2) very welcome,Tea / Coffee available after the meeting. See website for further information. Free parking – Doors open 1.30 am. Tea / Coffee available after the meeting. “Working with Watercolour” is an art course for beginners and improvers in watercolour painting. It starts on May 2 for 7 weeks and runs on Thursday mornings from 9.30-11.30 am. 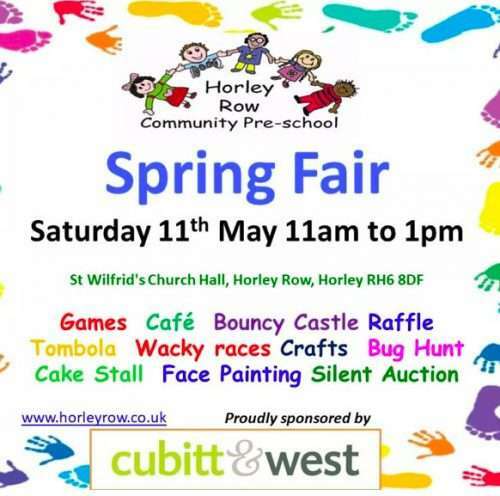 Horley Row Community Pre-School Spring Fair – Saturday 11th May. Visit the Run Gatwick website. The Horley Residents’ Forum Meeting has been combined with the Town Meeting. Horley Town Council have announced that a Residents’ Forum Meeting will be combined with the Town Meeting on Thursday 16th May. The usual Town Meeting business will be conducted. The meeting will still include a Question and Answer Session with Leon Hibbs, the RBBC Officer responsible for Air Quality Monitoring in Horley. There will also be updates on matters raised at previous Residents’ Forum Meetings and the opportunity to raise any other matters of concern. Volunteer and join in the fun: Girlguiding in Horley, Smallfield and Salfords. Come and enjoy activities for adults and girls. We have units in Smallfield, Salfords and also Horley, in many meeting places. Many of us join for our children but stay because we find fun and friendship. There’s always something new going on. Come along and be part of the world family of Guiding. Contact us via this web page. Reigate & Banstead Borough Council have announce the brand new Reigate & Banstead Business Awards. The awards ceremony will take place at Reigate Manor, Reigate Hill, Reigate, RH2 9PF on 6th June 2019. 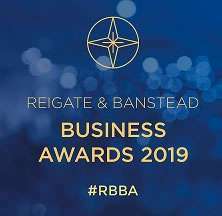 These awards are the first of their kind for the borough and have been created to celebrate the diverse range of successful businesses right here in Reigate & Banstead. Shortlisted businesses will be invited to a special awards evening hosted by none other than broadcaster Nicholas Owen. Check out the Horley & District Chamber of Commerce website to see all of the benefits on offer. The Community Arts & Crafts workshops, based in Horley, would love you to join them. They hold 2 sessions a week every 2 weeks. No experience necessary. Details & booking can be found on their website. We list four local minor injuries units on our health page. Click here to visit our health page. Visit our Local Transport page to get info on local buses, trains and taxis. 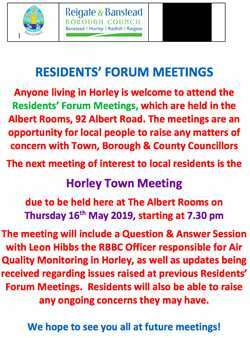 The next meeting to be held at Horley Town Council Offices, 92 Albert Road, Horley. 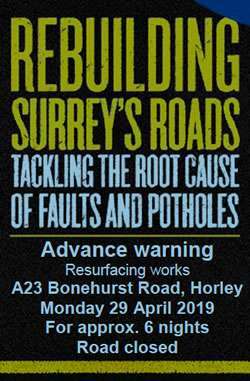 A23 Bonehurst Road, Horley will be closed for approximately six nights from Monday 29th April. 8pm-6am. The former Albert Road Club in the centre of Horley has been renamed and refurbished. 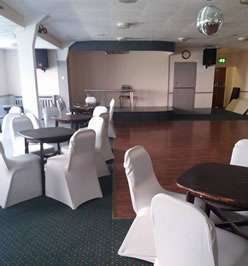 The club relaunched as the Earl Haig Sports and Social Club. They have great new facilities and are open for new members. Click here to donate now to St Catherine’s Hospice. Line closure are still taking place on the Brighton Line in April and May. The rail line to Brighton between Three Bridges and Brighton is undergoing major repair works to the tunnels, rail lines and stations over the next few months. 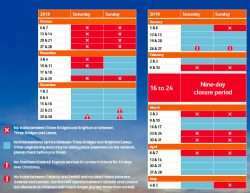 A calendar and more info can be found on the Brighton Main Line website. 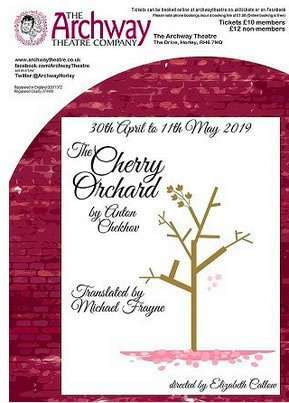 Horley’s Archway Theatre has a wonderful variety of productions coming up this year. Visit the Archway Theatre website. Are you over 50 years old and have you ever wanted to volunteer, but feel that you just don’t have the time? Come along to our Volunteer Fairs in April to meet local voluntary organisations and speak to them about their flexible, short term and regular volunteering opportunities. We warmly invite you to Church Services during Holy Week. Palm Sunday 14th April 10 am with processions of palms. Monday, 15th, Tuesday 16th, Wednesday 17th 7pm Evening Prayer. Maundy Thursday 18th 6.30pm Holy Communion and Stripping the Sanctuary. Good Friday 2pm Meditation at the Cross. Easter Sunday 21st April 10 am Family Communion, bring a flower to help make up the Easter Cross. Try bowling for free. We have all the equipment you need, just wear flat soles shoes/trainers. Chat to club members, find out what we offer & why we love the game. Coaches will be available offering guidance & support. Refreshment & bar available. 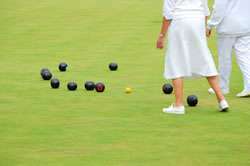 Visit the Horley Bowling Club website. Open evenings every Friday in May from 11th at 6.00pm so drop in after work. East Surrey College Open Event, Saturday 15 June 2019 – 10:00 – 13:00. Find out what we have to offer, meet staff and take a look around our fantastic facilities! Limited free parking available onsite. This year, The Friends of Meath Green Junior School have been chosen by the Co-op. Please visit http://www.mgjs.org/book-cook-project where you can find further fundraising events, including our comedy night with Dominic Holland that we are running to support a project of a double decker library bus and cooking room. Visit the Meath Green website. We support people with mental health, learning difficulties and autism. We run an office project in Horley and Leatherhead and wondered whether any of your readers have any jobs for us to do. We do not do this for profit just to teach skills that will help our clients obtain paid jobs. All we would ask for are any costs to cover printing and stationery if its needed. Visit the County Care website. Gatwick Aviation Museum is a great place to take the kids. Visit Gatwick Aviation Museum Friday, Saturday and Sunday. As well as historic 1950s aircraft we give guided tours of the anti submarine Shackleton aircraft by a pilot, navigator and air engineer who flew in the aircraft and groundcrew who serviced them. Check our website or Facebook for opening times, location and events. Visit the Gatwick Aviation Museum Website. Burstow Scout Group currently has spaces for Boys and Girls. Beavers and Cubs meet on a Monday in Smallfield. Scouts meet on a Thursday. Visit the Burstow Scout Group website. Find out more about the Young People’s Clubs in the Horley and Gatwick area. It’s FREE to post your job vacancies on Horley Online. Just click here and send us the details. St John Ambulance, Horley & Gatwick Unit is looking for volunteers to train to become Event First Aiders. Read more on the Horley Online jobs page. Horley Online is a community website for Horley and the Gatwick area. Horley Online is a social enterprise run by local people for the community of Horley, Burstow, Charlwood, Copthorne, Earlswood, Gatwick, Hookwood, Horne, Outwood, Salfords and Smallfield. We have no affiliation to any political parties or local or borough councils. Our aim is to provide support and information for our local community. A new Horley Business Park has been proposed. To see more details visit our property page. Did you know that Surrey and Sussex NHS offer a range of apprenticeships as well as local jobs at East Surrey Hospital? Visit our jobs page for more info. Over 8,900 local people ‘Like’ the Horley Town Facebook page. Go there now. Susy Radio is our partner community radio station for Horley, Gatwick, Redhill, Reigate, Crawley and the surrounding villages. Established 1996. Tune in now to Susy Radio. Click on the logo to listen live online. Visit the Susy Radio website. At our local recycling centre at Earlswood you can donate pre-owned items from your home or garden to be re-sold at their Revive Re-use Shop. This really helps reduce waste. It also helps support local charities. Check out the Revive Re-Use Shops Facebook page. Click here to see opening times for the Horley's nearest Revive Re-Use Shop. Click here to see the average property prices in and around Horley, Smallfield and Charlwood. Horley Online Media reach an average of 40,000 local people a week. That's a lot of local people! 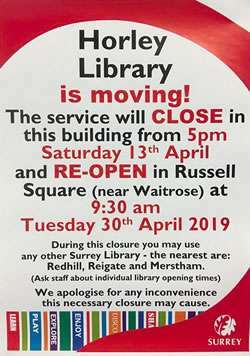 Horley Library is moving. Click here to find out more. If you think you have received an email that looks suspicious or have been contacted by someone you are not sure about check on the Action Fraud website.